Reach even further with God’s love and dignity! Today, you’re invited to share the life-changing hope of Christ with even more people — as a Platinum Eagle Partner! Your faithful prayers and monthly financial support will make an even greater impact at a critical time in our hurting and chaotic world: keeping the Good News of Christ on the air and welcoming multitudes into the eternal, unshakable family of God. 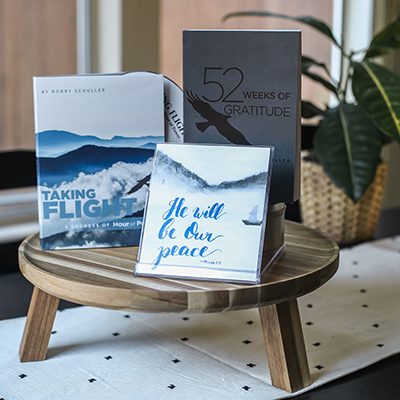 As our thanks for your Platinum Eagle Partner support of $200 a month — or $2,400 a year — we will thank you by sending theTaking Flight DVD set, the New Beginnings Cards, a copy of the book with your name embossed to keep for yourself, PLUS three additional copies (without embossing) to encourage your loved ones. Shipping is included for all Hour of Power offers and will be shipped by the best method determined by Hour of Power.